Would it be possible to create an artificial iron star? I ran a quick calculation, and the mass of iron required to form a black hole is on the order of 10^40kg. So, suppose that in my story there is this almost much iron available to somehow be brought together in one place, but the builders don't want to create a black hole, but instead want to fuse iron into heavier elements. In the beginning a large sphere would be created, and then more iron would be added with low temperature and kinetic energy. For the purpose of the story ignore any practical issues with doing this or the usefulness thereof. Such a large mass should, under its own gravity, be under tremendous pressure (and possibly temperature) at the core. Normally, iron doesn't fuse because such a reaction would be endothermic, but because we aren't starting with a star is it possible for such fusion to occur in such an artificially constructed setting? For comparison, the mass of the Milky Way galaxy is estimated to be only about two and a half orders of magnitude more than the amount of iron we are talking about, so this is a LOT of iron. First, you seem to be familiar with the binding energy curve for elements. 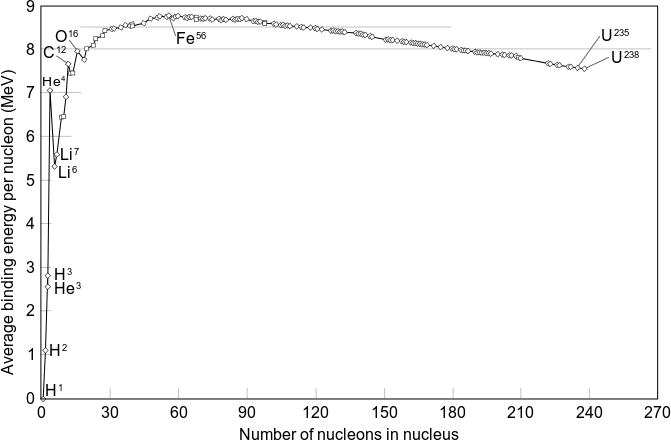 As you can see, iron is at the top of the binding energy curve, so it has the most energy per nucleon. If you wanted to 'fuse' iron into something heavier, then you need to add energy. This is not impossible to imagine happening. The conditions inside a supernova allow nucleosynthesis of elements heavier than iron, so incredible though supernovas may be, perhaps some super-advanced alien race could accomplish it by adding enough energy to a giant iron core. The problem here comes from the number of neutrons present in Iron. Iron does not have enough neutrons to form Uranium or some other heavier elements that you suggested. Having iron and only iron in your core gives you a limited number of things that you can make. You can only add nuclei together that have 26 protons in them, so the first order fusion products will all have 52 protons, and somewhere between 56 and 64 neutrons. From a chart of nuclides, we can see that none of these configurations is stable. 52 protons is tellurium which requires at least 68 neutrons to be stable. Thus, these short term fusion products will decay, via $\beta+$ decay, into mostly tin, with some cadmium, indium and silver and the like mixed in, depending on the initial isotopes. This decay takes elements 'down' the periodic table; tellurium has a higher atomic number than any of its products, so $\beta+$ decaying isotopes will end up with a lower number of protons once the decay chain stops at a stable isotope. This process could potentially continue, with the tin fusing with another iron atom to make osmium, which would decay into ytterbium or hafnium; that could then pick up another iron, etc. The problem is that eventually your fusion products are going to be elements large enough that they need massive amounts of neutrons to maintain stability. While iron can be stable at 14:13 neutrons:protons, lead is only stable at 62:41; and uranium's most long lived isotope is 73:46. Ultimately, large atoms that are sufficiently neutron deficient will start to undergo $\alpha$ decay, where they lose an $\alpha$ particle which is 2 neutrons and 2 protons. In this decay, they will rapidly drop atomic number until you are back close to where you started. Heavier elements obviously got created, but how? By the r-process, where nuclei of atoms with atomic numbers above iron accumulate extra neutrons. These extra neutrons cause isotopes to $\beta-$ decay. The result of this decay is that an element moves 'up' the periodic table, gaining atomic number as unstable neutrons turn into protons. This is the only way that mostly stable elements high up in the period table (like uranium and thorium) can be formed. The r-process occurs in two situations (that we know about). The first is a neutron star collision, where there are obviously plenty of extra neutrons to spare. The second is in the core of a Type IIb supernova, the most violent kind. Much is unclear about how this works; there has only been one observed, nearby Type IIb supernova, and the first neutrons star merger was observed in 2017. 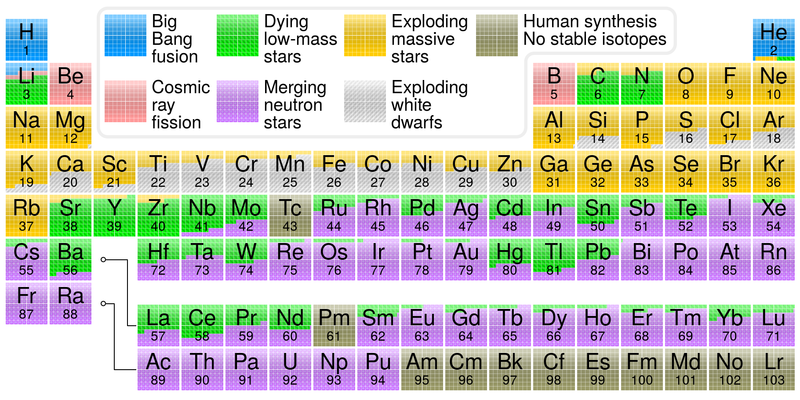 Here is a chart of the source of nucleosynthesis for elements. You can see that the neutrons star merger (which is also possibly occurring in Type IIb supernovas) is how you get the vast majority of your heavy elements. How can you get enough neutrons? In a supernova, and in stars in general, neutrons form from the p-p fusion chain. Two protons fuse together, a highly unstable configuration. This immediately (as in, no measured half-life immediately) $\beta+$ decays into deuterium, which has a neutron. Deuterium can then fuse with other assorted combinations of hydrogen and helium to form free neutrons. In a core collapse supernova, the neutron flux is theorized to be such that extra neutrons can accumulate to the heavier elements, thereby making even heavier elements. From your alien's perspective though, the best way to add neutrons has got to be a neutron star. If they can get their hands on a galaxy's worth of iron, they can probably find a neutron star lying around too. Take a giant iron ball, add an immense amount of energy, and then throw in a neutron star. Metal! As you pointed out, iron is normally the element where typical solar fusion ends. However, if enough alpha particles are present, nickel and zinc, could result. Also, neutron capture would require less energetic means to generate elements higher than iron. This is the contribution supernovae make towards forming these elements. And you also mention bringing all of that iron together, which would be a very bad idea if you are trying not to create a huge lump of molten lead. Maybe bring it all together in controlled bursts, to match the amount of alpha particles or neutrons you can toss at it, then remove your newly formed elements to a safer distance. Not the answer you're looking for? Browse other questions tagged reality-check hard-science stars or ask your own question. Is a gas giant more massive than its star possible? Is binary planets orbiting a triple star system possible? Would it be possible to create “Hard Light” out of photons and similar particles? Would alien litterbugs accidentally create a star?